There is a growing and continual interest among organizations in the private, public and non-profit sectors for programs and services to create a business landscape that is prosperous and equitable, and to assist other groups of people and organizations that may not have the same opportunity. The push to remain competitive continues to intensify, and the most forward-thinking organizations are looking to gender diversity initiatives to drive innovation and growth. The Rotman Initiative is a trusted partner to forward-thinking corporations and organizations seeking to broaden their community profile, attract more female employees, or developing their leadership talent at every level in the organization. Send your most promising female leaders for short, intensive leadership development. Programs are available at three critical pivot stages of the talent pipeline: early, mid-to-senior, and executive levels. Improve your community profile and support capacity building by sponsoring a non-profit leader for leadership development. We are seeking organizations who are interested in supporting a program bursary for visible minority women, aboriginal women, and women in sectors such as the non-profit, sports, and mining, to attend. Improve your community profile and change market perceptions by sponsoring our Back to Work Program. Join a growing list of companies who have chosen to support professional women returning to work. Your organization will gain access to motivated and talented women who are ready to contribute to your organizational success. Our highly popular Women and Leadership Experts Speaker Event has attracted a loyal following within the business community. There is a unique opportunity to broaden your community profile by sponsoring our Diversity & Inclusion Symposium, and gain access to faculty and networking opportunities. If your organization has a topical theme that you are wrestling with, it may be of broad interest to other organizations. Contact us to flesh out the business challenge, and we can work with you to co-host a public event right here at Rotman. In the process, gain access to faculty and position your organization as an attractive employer. Another way to partner with the Rotman Initiative is through collaborative research projects, such as the Gender Diversity on Boards in Canada report that was recently completed. Financial or in-kind donations are also welcomed from the business community. If you or your company would like to support the Rotman Initiative but are not sure how to get involved, feel free to contact us to discuss how we can partner together. 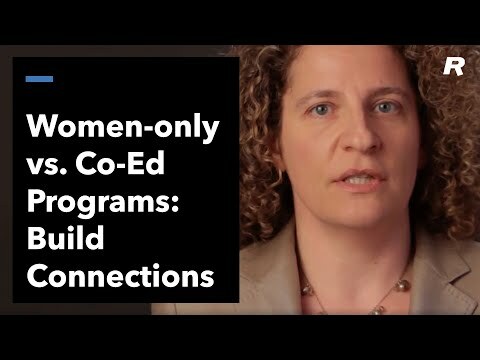 Associate Professor Tiziana Casciaro compares and contrasts women's and co-ed executive development programs. She discusses the unique value that can be added to the experience in women-only classroom settings.